On January 3, 2019 Governor Cuomo and MTA announced a new plan to repair the L train tunnel. As we receive more information on the new plan we will evaluate the projects highlighted below to determine how best to move forward during the L Project. The information below reflects DOT’s mitigation efforts prior to this announcement. 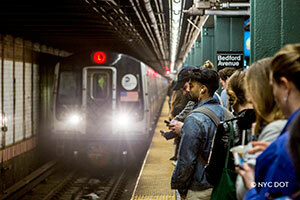 Sign up for L Project eblasts by New York City Transit. For 15 months starting in April of 2019, all MTA New York City Transit (NYCT) L train service will be suspended across the East River and within Manhattan to repair damage caused by Superstorm Sandy. The L train will still run within Brooklyn, serving all stops. The temporary closure will directly affect 275,000 of the L Train's 400,000 daily riders, and indirectly affect many more throughout the city. All alternative transit services and traffic management policies are temporary for the duration of the L train closure. Full details about the L train closure are available via MTA New York City Transit. NYC DOT plans to begin implementation of the proposed street treatments beginning in summer 2018, with substantial completion expected in winter 2018. The anticipated start date of restricted traffic access along 14th Street is still pending, and is largely dependent on NYCT’s launch date of M14 SBS. For more information about the Canarsie Tunnel Reconstruction project and its resources, visit http://web.mta.info/sandy/resources.html. More info about the impact of Sandy on the Canarsie Tunnel is available here web.mta.info/sandy. Supplemental Environmental Assessment and Section 4(f) Review documents. See the detailed traffic analysis related to the planned L Train Canarsie Tube Closure beginning in April 2019. The analysis looks at existing conditions and evaluates potential impacts of various options for mitigating the impact of the closure. NYC DOT has proposed street redesigns to mitigate the impact of the upcoming L Train closure. Visit DOT's Current Projects page to learn about safety improvement projects. 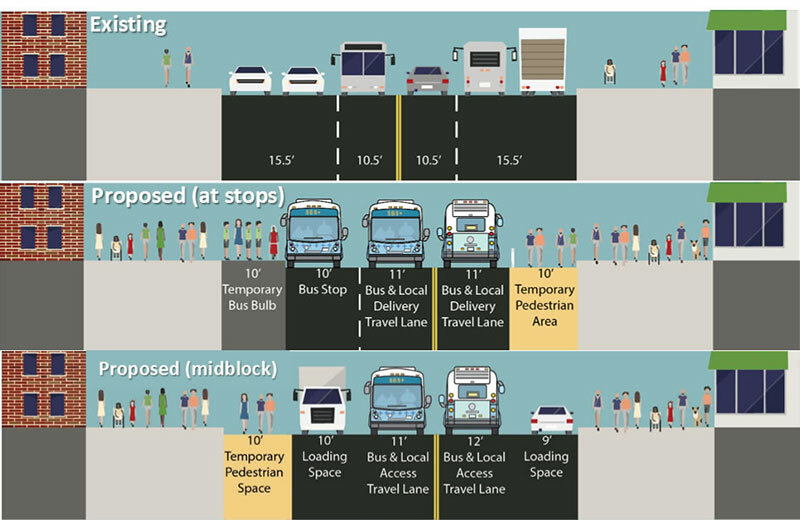 To support the extraordinarily demand for surface transit and increased pedestrian activity, DOT is proposing a “Busway” along the core of 14th Street (Ninth to Third Avenues eastbound and Third to Eighth Avenues westbound). Additionally, offset bus lanes are planned to be added from Eighth Avenue to Ninth Avenue westbound, and a combination of curbside and offset bus lanes are expected to be added from First Avenue to Third Avenue in both directions. The street redesign includes temporary bus bulbs and expanded sidewalks to the corridor. DOT also plans to add new pedestrian space along Union Square West from 14th to 15th Streets and 16th to 17th Streets. Under this plan, access to the Busway would be mostly limited to M14 local and SBS buses. In addition, Access-A-Ride vehicles, local deliveries, emergency vehicles, and private cars accessing parking garages would also be permitted. For all non-bus vehicles needing local access, motorists will be able to make a turn on to 14th Street, and then make the next available right turn off 14th Street. All vehicles will have access to 14th Street but only buses and emergency vehicles will be able to use 14th Street for through trips. These vehicles may turn onto 14th Street from the avenue closest to their destination, then exit 14th Street at the next legal turn. 14th Street bus priority treatments would be in effect from 5AM to 10PM every day. During the L Train closure, L train shuttle routes will travel across the Williamsburg Bridge down Grand Street making stops at Grand Street and Bushwick Avenue. NYC DOT will be implementing a parking protected bike lane in the eastbound direction and a protected bike lane in the westbound direction. 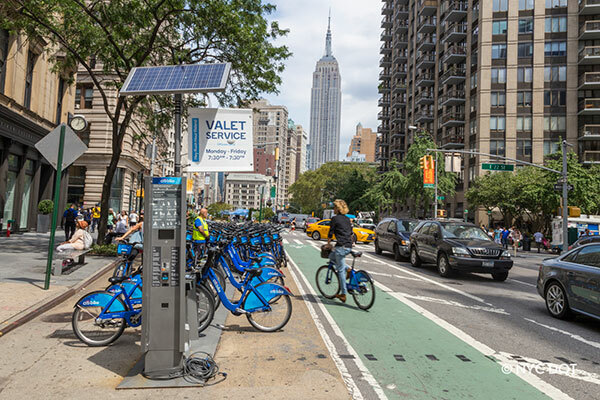 This proposals purpose is to add connectivity to the already existing bike network and to serve the large increase in cyclists expected during the shutdown. As part of the project, portions of Grand Street will be dedicated to local access and buses only from 5AM to 10PM, seven days a week: Bushwick Avenue to Union Avenue in the westbound direction, and Keap Street to Rodney Street in the eastbound direction. Vehicles needing local access can turn onto Grand Street from the cross-street closest to their destination. For through access between the Williamsburg Bridge and points east, vehicles must use an alternate route such as Metropolitan Avenue. NYC DOT will be adding loading zones to help trucks making deliveries to Grand Street’s many businesses. As part of the project, NYC DOT will also implement short segments of bus lanes from Morgan Avenue to Catherine Street and Rodney Street to Keap Street. Currently, more than 7,500 bicycles use the bridge daily, and DOT anticipates a sharp increase in ridership during the L train shutdown. This project will improve connectivity on the Manhattan side of the bridge in anticipation of the projected increase. DOT is proposing a Jersey barrier protected bike lane and pedestrian safety enhancements on Delancey St between Clinton St and Chrystie St in Manhattan. 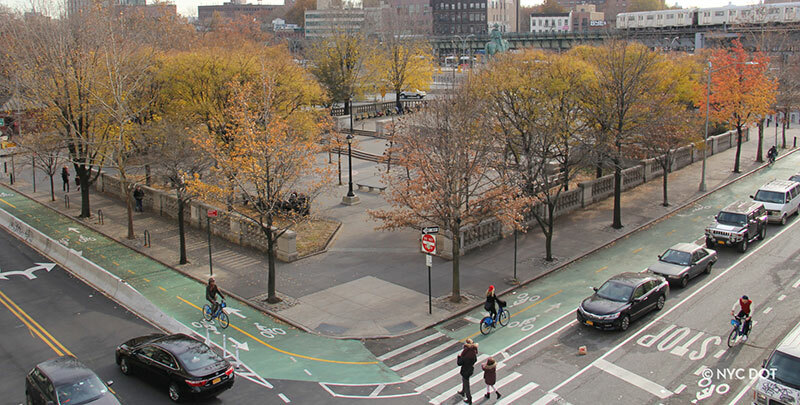 The proposal aims to improve bicycle access from the Williamsburg Bridge to the existing protected bike lanes on Allen St and Chrystie St.
As part of the project, NYC DOT will also implement pedestrian safety improvements, including painted median extensions along the Delancey St median, creating shorter safer crossings for pedestrians. This project was presented to Manhattan Community Board 3’s (CB 3) Transportation Committee in April 2017. CB 3 supported the proposal and implementation is expected to begin Summer 2018. DOT is planning bus priority on Delancey Street and Allen Street to accommodate the high number of L train shuttle buses. On Delancey Street from Williamsburg Bridge to Bowery westbound, NYC DOT will implement an offset bus lane to help the shuttle buses move freely throughout this area. From Essex Street to Williamsburg Bridge, curbside bus lanes will be added. On Allen Street from Delancey Street to Houston Street, offset bus lanes will be added in both directions. Buses currently running on these streets will benefit from these lanes. With the L Train closure, DOT expects bike ridership to double at a minimum. To address this dramatic increase in cyclists, DOT is proposing a westbound bike lane on 13th Street paired with an eastbound bike lane on 12th Street in Manhattan to offer a safe, accessible option for thousands of daily cyclists. Parking on the south side of 13th St (Greenwich Ave to Ave B), and the north side of 12th St (7th Ave to Ave C) would be removed to allow for six feet wide bike lanes in either direction along the curb. A protected lane is also proposed along Greenwich Ave (8th Ave to 13th St) adjacent to the bike share station along the south curb. The bike lanes would be separated from the vehicular roadway with painted four- to nine-foot buffers and flexible delineators. Shared and standard bike lanes with no impact to travel lanes or parking lanes are proposed along Horatio St (Hudson St to Greenwich Ave), W 13th St (Hudson St to 8th Ave), and Greenwich Ave (13th St to 12th St) to provide wayfinding connections to 12th and 13th Street. See the Project details. As a result of the Canarsie Tunnel closure, the Union Square subway station is projected to see some of the greatest changes in passenger flows. 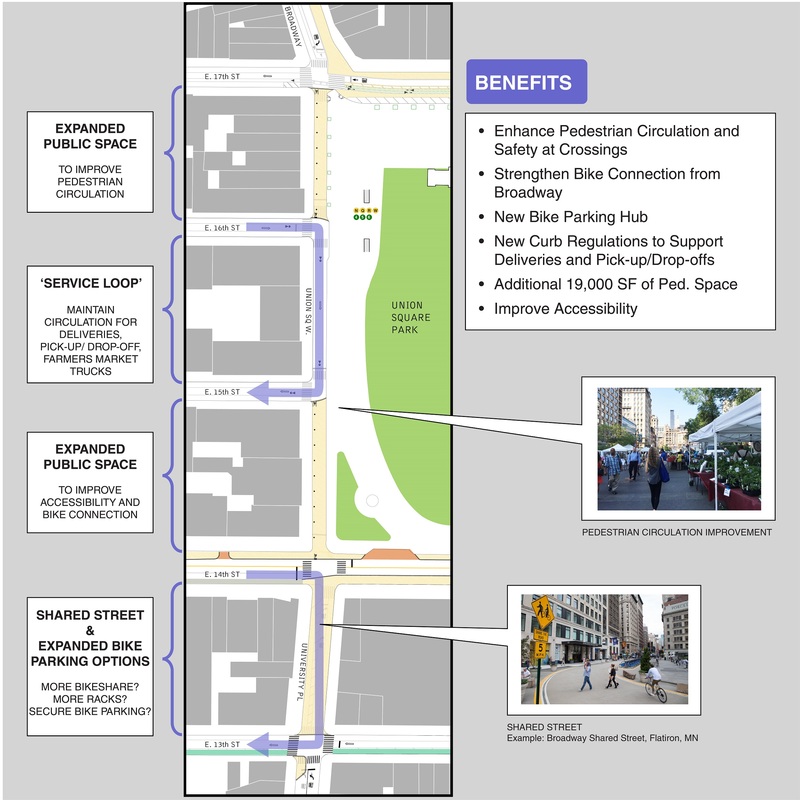 With that, increased pedestrian space and bicycle parking space would be needed to provide relief to already congested sidewalks and meet the new pedestrian and cycling demand. Create shared street, on the block of University Place between E 14th Street and E 13th Street, just south of Union Square with expanded bike parking options. 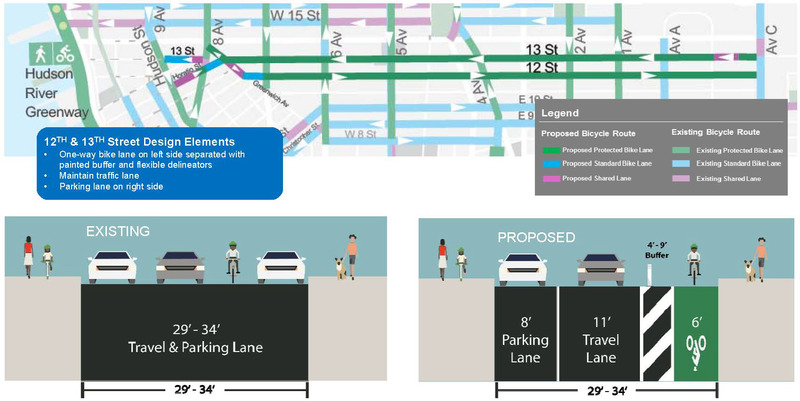 DOT proposes a protected two-way bike path on E 20th Street in Manhattan to offer a safe, accessible option for an anticipated increase in bicycle traffic. The proposed design on E 20th Street, between 1st Avenue and Avenue C, would upgrade standard bicycle lanes to a standard two-way bicycle path along the north curb, separated from the vehicular roadway by a channelized buffer and floating parking lane. The proposal includes standard bus boarding islands along the route for M23 and M9 stops, as well as expanded pedestrian space and a shortened pedestrian crossing distances at Avenue C. The bike path would also provide an upgraded connection between the bicycle network and the East River Greenway, and would connect to L Train Shuttle Ferry at Stuyvesant Cove and M14 bus service (E 20th Street and Avenue C). The Williamsburg Bridge provides the most direct connection for many customers who rely on the L train. New temporary shuttle bus routes traveling across the bridge will need to move 30,000+ daily passengers. Fast, reliable bus service is not possible under current traffic conditions, so DOT has proposed making the Williamsburg Bridge HOV 3+ from 5AM to 10PM, seven days a week, in order to prioritize buses on the bridge. HOV 3+ will require vehicles to carry 3 or more passengers. NYC DOT is proposing westbound alternatives for cyclists biking from Maspeth to the Williamsburg Bridge. This includes additional facilities on Metropolitan Ave from Grand St to Morgan Ave and Devoe St from Morgan Ave to Union Ave. These additional bike lanes will supplement the existing network, providing a growing number of cyclists a safe transportation option as part of the L Train Mitigation. Launching a 1,000 Pedal-assist bike Interborough Shuttle Service over with hubs in both Brooklyn and Manhattan. DOT and MTA NYCT are committed to ongoing community outreach and dialogue through the planning and implementation of this project. MTA and DOT are working closely with the affected communities and have had over 70 stakeholder meetings to develop the mitigation plan. In addition, DOT and MTA have hosted public workshops and open houses to engage with the public. DOT will continue to work with businesses and residents on adjacent streets regarding traffic-calming strategies and curb access needs ahead of implementation, and will continue to respond to concerns once the L train closure begins.